The following is a description of the process of handsaw manufacture. 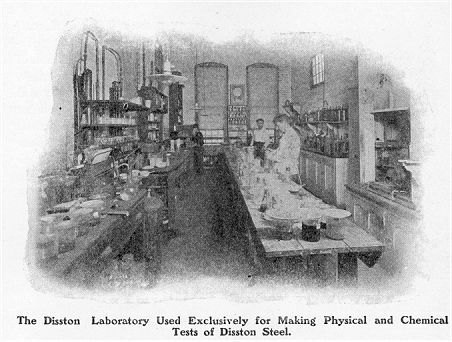 While heavy on promotion of Disston's products in places, the article is very informative. The operations required in the making of the DISSTON HAND SAW are both numerous and varied, to describe each would require considerable space, therefore the principal processes only will be taken up in their regular order. All Disston Saws and Tools are made throughout in the Disston Works, from the selecting and melting of the material itself to the finishing process; every operation being under the care of experienced superintendents and subjected to frequent inspection and tests. 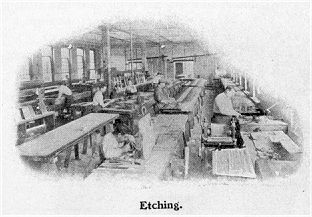 The Factory consists of fifty-four buildings; ground enclosed fifty acres, and there are 3,500 employees -- the Disston Saw Works, without exception, being the largest in the world and its production -- Quality and Quantity considered -- the FINEST and GREATEST. The DISSTON STEEL WORKS, which is part of the plant, is fully equipped with the latest appliances, machinery, etc., and has exceptional facilities for the making of CRUCIBLE STEEL peculiarly adapted for saw requirements. This is an important factor in the making and maintaining of HIGH QUALITY SAWS, for the steel is the foundation upon which rests all subsequent work. 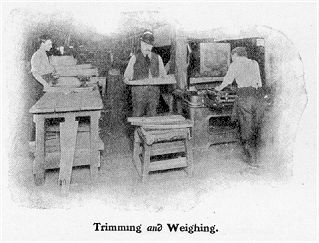 From the time saws were first made saw manufacturers had the greatest difficulty in obtaining steel of uniform quality, free from flaws and seams. 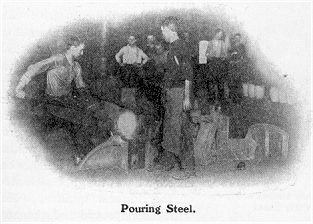 This difficulty was overcome in the Disston Steel Works after years of careful study and costly experimenting. 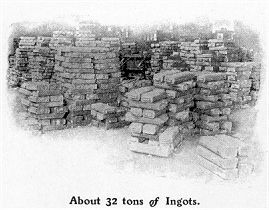 The Disston method of casting steel ingots not only does away with splitting, spalling and crumbling of teeth, but makes a hard, tough, elastic steel of the highest quality, which with the improved and patented processes of manufacturing and tempering guarantees the production of saws that for toughness, standing-up quality and uniformity of temper have never been equaled. 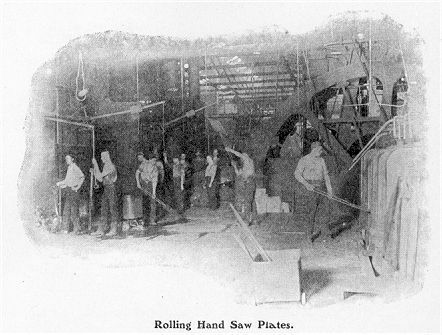 The Disston Saw Works was the first to manufacture saws from the raw material to the finished article. 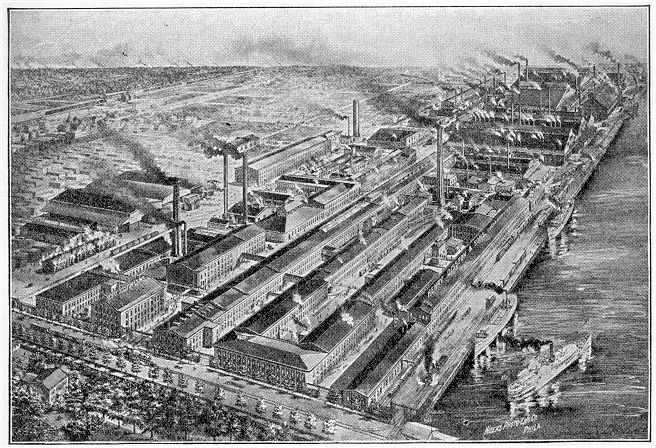 This, in fact, was the first successful Crucible Steel Melting Plant in America for saw steel, and in line with the making of progress, on April 24th, 1906, an Electric Furnace was installed in the Disston Steel Works and successfully operated for the melting of crucible steel, it also being the first of its kind in the United States. The material to be melted is carefully selected, of best quality, the various operations, from the melting to the rolling, are performed by men of long experience, and all steel is fully inspected before it is sent to the Saw Department, thus insuring the highest perfection. 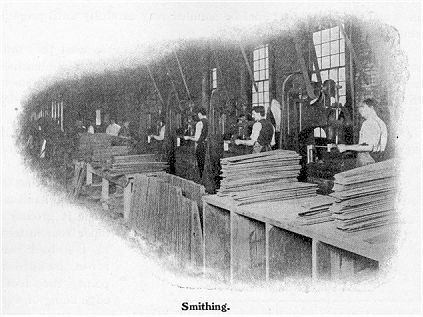 In the Saw Department the sheets of Crucible Steel, rolled to gauge, are trimmed under shears and cut into blanks for either straight or hollow-back saws as required. 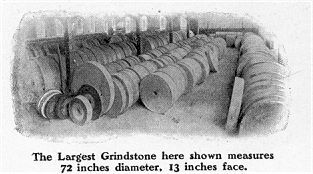 The blanks are now presumably of the same size and thickness, but to determine this, each blank is weighed, the heavier ones being used for saws with larger size teeth. 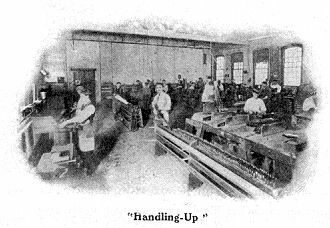 The next operation is that of cutting the teeth, which is done on a machine of special design, the blanks being fed in by hand. To the untrained eye the saw blade now looks as if it were ordinary material. The next step is an important one and is one of a series which helps to give character and value to the tool, i.e., the saw blades at this stage are in the soft state and must be ''Hardened." 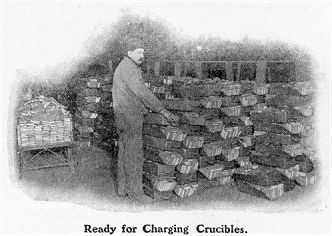 To do this they are placed in the hardening furnace, which is heated by the use of fuel oil. 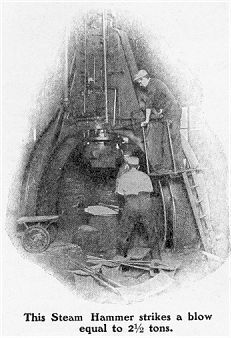 The saw blades in this furnace are heated to a certain temperature, then taken out and plunged edge first into a special hardening bath. This makes them extremely hard, in fact as hard as it is possible to make them and they must therefore be handled very carefully until properly tempered. 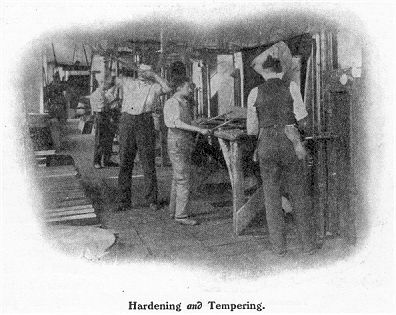 In order to make the saw blades so they can be used they must now be "Tempered," or a certain amount of this extreme hardness drawn according to the quality of saw desired, which is done by bringing them in contact with less heat than they were subjected to in the hardening furnace. This operation is a very delicate one. The next step is that of "Smithing." in this the blades are flattened and made perfectly straight, all inequalities being taken out by the skillful hammering of the mechanics. The blades are next "Ground" to gauge and to a taper so that the back will be thinner than the cutting edge. The back of the hand saw blade is ground to taper from the teeth to the back and from handle to point, the tooth-edge being of even thickness from end to end. A saw not ground to proper taper cannot be ranked as a high-class tool. After being ground they are returned to the smithers for "Looking-over" and preparing for next operation. Now follows "Tensioning." In this the blades are hammered so that they shall not be too "fast" or too "loose;'' but shall possess the proper tension, spring or character. If the blade is what is termed "fast" the metal is too long on the edge and needs expanding through the centre, or, if too "loose" the metal must be stretched on the edge. A saw not properly tensioned will run out of its course, in other words it will not cut straight and true. 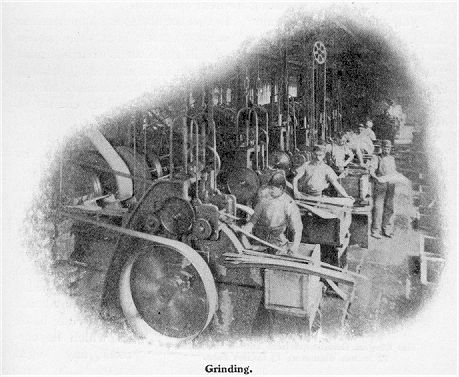 The blades are again passed to the grinder for the purpose of "Drawing" which is a finer process of grinding and prepares the surface to take the higher polish to be given by the "Glazing." Now comes the Blocking," which is an important operation and requires the highest order of skill. 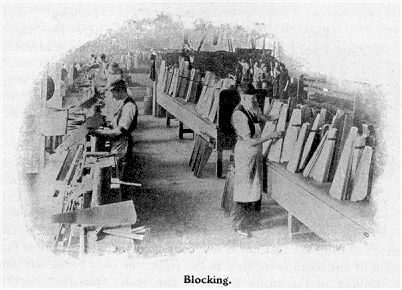 Each blocker is provided with an anvil and lignum vitae block on which he corrects any slight irregularities that may have been developed by the previous processes. The blades then undergo the "Polishing" process, then through the important operation of "Stiffening." 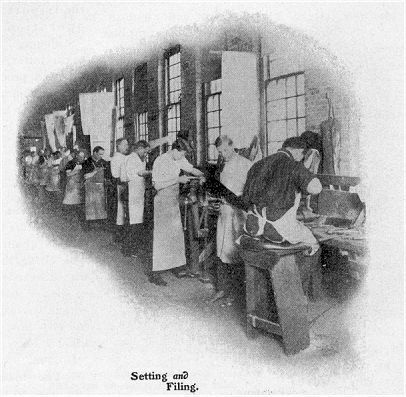 As to this latter, the different processes and hammering under which the blades have passed, has altered the arrangement of the molecules in the metal and in order to restore the desired qualities and spring they are stiffened in a special bath, which was originated and is known only to Disston. The blades now pass to the "Etching" room where the name, brand, trademark, etc., are put on. The next stage is ''Setting the Teeth." Each tooth is set by one or more strokes of a hammer; the experienced workman performing this work with wonderful accuracy and rapidity. 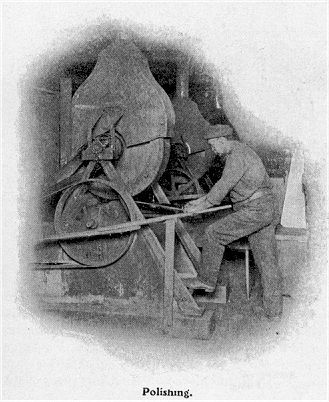 Setting the teeth of a saw consists of bending them so that the point of one tooth is inclined to the right, the next to the left, and so on throughout the entire length of the blade, thus they slightly protrude beyond the side of the saw blade, which is necessary to obtain sufficient clearance for the body of the blade so it will not bind in the cut, the amount of set required being somewhat lessened by the special grinding which leaves the blade tapering from toothed edge to thin-back, though extra thin-back saws are made so they will run without any set, but these are particularly adapted for hard, dry, seasoned lumber. They are now ready for "Sharpening," which, as will be noticed, is done after setting so as to avoid injury to the teeth. Each saw is well sharpened and filed so true that on holding it up to the eye and looking along its edge it will show a central groove down which a fine needle will freely slide the entire length. 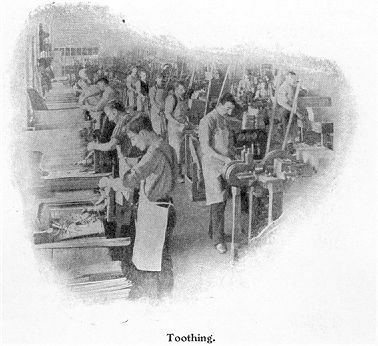 In filing and sharpening, the teeth are given a certain amount of bevel, according to the class of work for which they are intended; saws for hard wood requiring less bevel as well as pitch than saws for cutting soft wood. The saw is now complete; subjected to examination for correctness in hang of handle, then fully inspected, cleaned, and is ready for packing. The making of the Disston High Grade Hand Saws from start to finish calls for the most careful workmanship and constant attention. At each stage of the work the saws are inspected amid the system for accomplishing this is so thorough that it is almost impossible for an inferior article to pass out of the works as a high grade and perfect tool. The brand "Disston" is reserved exclusively for the high-grade goods which are never sent out under any other brand. 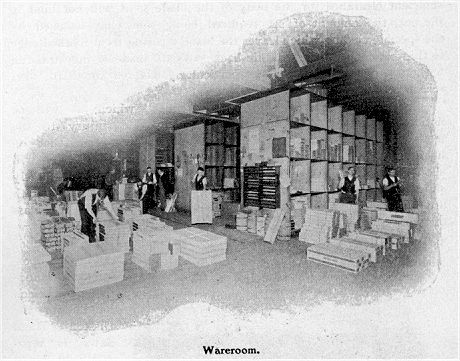 "The growth and development of the saw business in the United States has been phenomenal, as now and for some years past there have been practically no saws of any foreign manufacture imported into the United States, whilst on the other hand the American-made goods are exported very largely to all parts of the civilized globe." "THE WORLD IS OUR MARKET"